Sly James is the Mayor of Kansas City, Mo. He grew up riding transit in Kansas City, and has been a supporter of all modes of public transit. "Public transit holds cities together," James said. "It allows people to...move around the city, and that movement creates economic activity." The Rosa Parks Spirit Champion of Transit Award was presented to Mayor James, in honor of his long track record of advocating for public transportation. As early as 2007, Mayor James stepped up to co-chair the sales tax renewal campaign for public transit, which passed with 65% support. His advocacy, leadership and unwavering support led to the successful launch of Kansas City’s first streetcar in 50 years, generating ridership far beyond expectations. His commitment to transit continues today. The Rosa Parks Spirit Awards celebrate individuals and organizations that, in the spirit of Civil Rights Leader Rosa Parks, are making a difference in metro Kansas City and in public transit. This marks the fifth year for the awards, whose honorees have included U.S. Congressman Emanuel Cleaver, one of KCATA’s first black bus operators Ray Harris, the University of Missouri-Kansas City, and the Downtown Council. 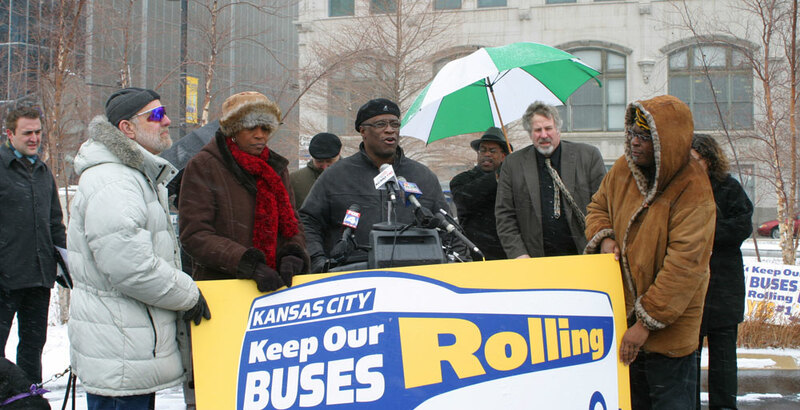 Sly James chaired an effort to stabilize increase funding for buses in 2007, supporting transit long before he became Mayor of Kansas City, Mo.